Thuja Green Giant is a tough plant – millions of happy gardeners can testify to that. However, that doesn’t mean it is made of steel, and some basic care will make the difference between a relatively poor performance, and an outstanding one. We think of summer as a season of relaxation and fun, and hopefully that is what we will all enjoy, but for plants it can be a season of high stress, with lack of water, high humidity and of course high temperatures all putting pressure on your trees to perform well. Now for Thuja Green Giant, summer should be a season of growth, and a continuation of that spring spurt, when new shoots emerged rapidly and threw a fresh coating of bright green over plants darkened by months of winter. if water is in short supply, instead that promise of adding a foot or two can turn into a few inches, since without water plants cannot grow. This is especially likely to be a problem in the early years of growth, since mature trees have developed deep, extensive root systems. These allow the tree to draw on water reserves in deeper soil levels, even when the top foot is parched and dry. Don’t wait until you notice your new hedge looking crisp and brown – by then it is probably too late! Keep an eye on it, check the soil by scraping a little away from the surface, which will always be dry long before lower levels dry out. While it is important not to drown your plants, in summer, dryness is almost always a greater threat. To encourage the deep rooting needed for long-term drought resistance, you need to prepare the soil well before planting. Deep digging when preparing your planting area will make it easy for those roots to begin their journey to lower levels, and encourage them to go down, rather than stay in the shallow upper layers. Smart gardeners dig deeply – 12 inches down is not too much at all. If you cannot easily push a full-sized spade its full length into the ground, then you need more soil preparation. Borrowing or renting a full-sized tiller is a good idea, as by running it over the area several times you can get good, deep soil preparation without the sweat and work of hand-digging. Don’t be fooled by the way a tiller makes the top few inches look good – go over the area several times until the tiller has sunk right down. Even with the best soil preparation, it still takes a couple of seasons for your trees to become well established, so plan on regular watering until then, especially during these dry summer months. Newly-planted trees may need watering twice a week if you plant just before or during hot weather. 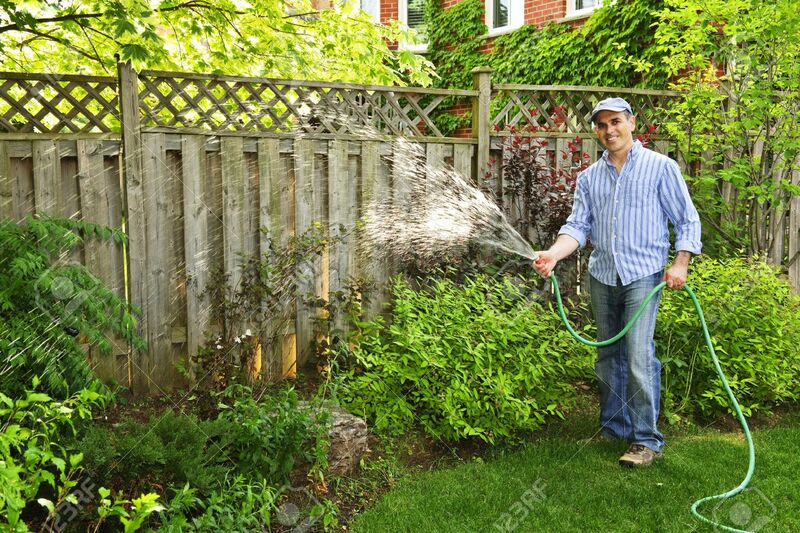 Remember too that thorough watering when you actually plant is important too. No matter the weather, or how wet the soil seems, water deeply when planting. The easiest way to do this is by pausing while returning the soil to the planting holes. After you have replaced and firmed down about two-thirds of the soil, flood the hole with plenty of water. It will drain right down around the roots, not run away across the surface, as can easily happen if you wait to fill the holes with earth before watering. Then you can put back the remaining soil, and leave the surface neat and tidy, without mud everywhere. Once you have finished planting, plan on watering once a week during cooler weather. Now that summer is here, and especially if you have sandy soil, twice a week is not too much. Regular watering through the growing season will keep your plants growing flat out, not falling to a crawl when the soil around them becomes dry. A useful way to make watering much easier, if you have planted a hedge or screen of Thuja Green Giant, is to install a porous pipe. These pipes are inexpensive, and look just like a black hose pipe. When they are filled with water it flows gently from them all along the length. Thread one in and out of your hedge, and connect the end to a hosepipe. To water, all you need to do is open the tap, go away, and come back a few hours later to turn it off. An inexpensive timer can be put on the tap to do the whole job for you – even if you are away on summer vacation. You also save a lot of water by this irrigation method, instead of using a sprinkler, where a lot of the water evaporates immediately, especially during hot, windy weather. Adding a mulch layer over the root zone area will help prevent water from evaporating into the air, and even more importantly, it will keep the soil cooler, which plants enjoy. Most plants like a root zone that is significantly cooler than the atmosphere, as roots grow best at lower temperatures. Now that you have taken care of the water needs of your hedge, don’t forget nutrition. Young plants do best on a diet of liquid fertilizer, so stock up on some liquid hedge food. These come either as powder you to a can of water, or as liquids that you also add to a can. Even easier is to use a hose-end applicator, as you can simultaneously water and feed that way, without carrying cans back and forth. Once every two to four weeks from spring to early fall is best during the first couple of years, and your Thuja Green Giant plants will reward you with lush, rich green growth and several feet of it. Once your plants are better established, you can switch to a slow-release formulation. These granules only need adding once a year, in early spring, so the work is greatly reduced. They release their nutrients steadily, so it is important to get the dosage right. Most come with applicators that make it easy to do that. This is one time when more is not better at all. You may pay a higher price for these types of fertilizer, but the pay-back is in reduced effort for you. With these simple tips, summer will become a time when your plants put on their best, instead of languishing in dry conditions, and even suffering long-term damage.